The responsibility for removing athletes from the practice/game area in a timely manner lies with the head coach of the NYAA team(s). If the head coach is not present, an assistant coach will assume responsibility. During game days, the Director, Coaching Staff, member of the Executive Board or officiating staff has responsibility for clearing the fields. The NYAA Coach or Director/Officer will inform the visiting team of NYAA's policy with regards to lightning during pre-game warm-ups if weather conditions warrant. The NYAA Coach/Director/Officer will monitor impending conditions, will watch for lightning and listen for thunder, and will be responsible for determining when the fields are to be cleared. When thunder or lightning are detected or imminent, the NYAA Coach/Director/Officer will alert all players and spectators and suspend all games/practices. Everyone must evacuate to a safe structure or location. A safe structure at NYAA would be defined as either inside the NYAA Clubhouse /garage /school building/church (e.g., a solid structure). The exterior of a structure and the pavilion area(s) are not safe areas and these areas should be cleared. Everyone who is not inside one of these structures should be sent to their vehicle. A vehicle is considered safe if it is fully enclosed with a hard metal roof, rubber tires, and completely closed windows. Persons should not touch the sides of the vehicle! Convertible and "soft-top" vehicles and golf carts do not provide a high level of protection and cannot be considered safe from lightning. 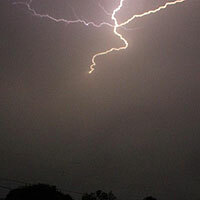 Persons should avoid using plumbing facilities and land-line telephones during a thunderstorm. If unable to reach safe shelter, persons should stay away from the tallest trees or objects (i.e. light poles, flag poles, etc. ), metal objects (i.e. fences, bleachers, etc. ), individual trees, standing pools of water, and open fields. Persons should avoid being the highest object in an open field (crouching is recommended in this event). In situations where thunder and/or lightning may or may not be present, yet someone feels his/her hair stand on end and skin tingle, LIGHTNING IS IMMINENT! Therefore, all persons should assume the "lightning-safe" position as described above. In situations where a lightning detection or warning system is operating, all coaches, directors and participants must follow posted procedures. A cellular and/or portable remote phone is a safe alternative to land-line phones, if the person and the antenna are located within a safe structure or location, and if all other precautions are followed. All individuals should have the right to leave a site or activity, without fear of repercussion or penalty, in order to seek a safe structure or location if they feel that they are in danger from impending lightning activity. Personnel should not return to the practice/game area until twenty (20) minutes have passed since the last lightning flash or the lightning detector indicates that lightning is greater than 20 miles away. Each time lightning is observed and/or thunder is heard, the "20-minute clock" is to be reset. Blue skies in the local area and/or a lack of rainfall are not adequate reasons to breach the 20-minute return-to-play rule. Lightning can strike up to ten (10) miles away from the rain shaft of a storm.